by Chris Eger, Guns.com| Jenkins, Kentucky bills themselves as a “city built on coal,” and one byproduct of its early days is a Thompson submachine gun used to protect the mine’s payroll. Built in 1912 by the Consolidation Coal Company (now Consol Energy) and named after one of their major investors, the town later picked up the early Thompson, which was advertised in the 1920s as an “Anti-bandit gun,” as added security for the burgeoning mining operation. 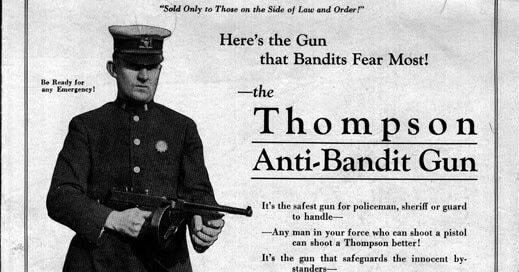 The Auto-Ordnance Company advertised their Thompson submachine guns in the days before the National Firearms Act was a thing as an “Anti-bandit gun,” and sold them commercially to adventurers, banks, and businesses in addition police and the military. “The story we’ve always been told is they use it to guard the payroll when the money would come in on the train,” Jenkins Mayor Todd Depriest told LEX 18. Now, with the gun long ago turned over to the local police, city officials are looking to sell the NFA-regulated mega collectible rather than let it continue to rest in retirement at City Hall. The gun, which looks to be an early 1921 Colt model, is reported by WYMT to have a two-digit serial number. As such, the city is hoping to get between $75,000 and $110,000 for the vintage room broom. The estimate is not too far off, as a four-digit 1921 sold in 2015 for over $80,000. However, similar guns have sold for closer to the $40-to-$50K mark. Last month, an early Colt tied to legendary FBI agent Melvin Purvis and gangster “Pretty Boy” Floyd went for $69,000 against an expected high of as much as twice that amount. The move by the Kentucky city to part with their select-fire heirloom is not without precedent. 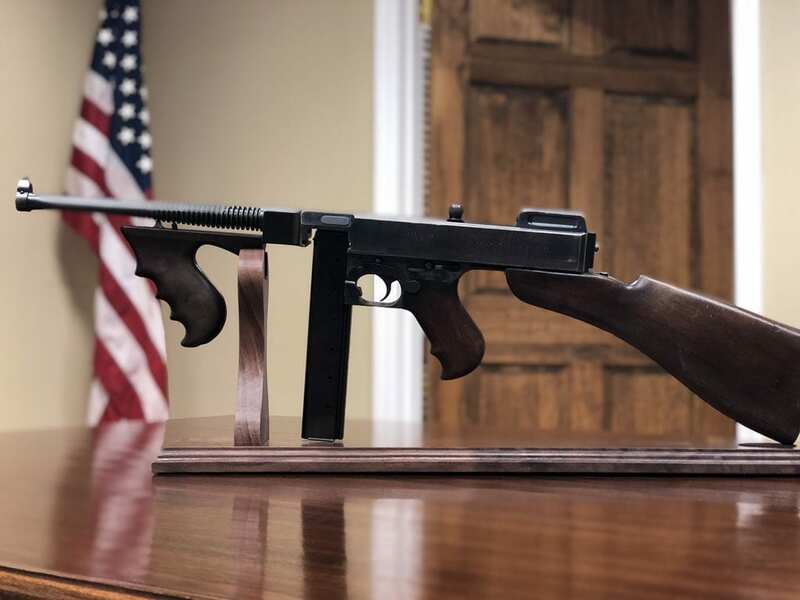 In 2014, the Forsyth County Sheriff’s Office in North Carolina asked county supervisors to swap a pair of early transferable Thompson submachine guns for a truckload of 88 new Bushmaster rifles. The sheriff’s Tommy guns were valued at $60,000 and had been gifted to the department by a local tobacco company in the 1930s. 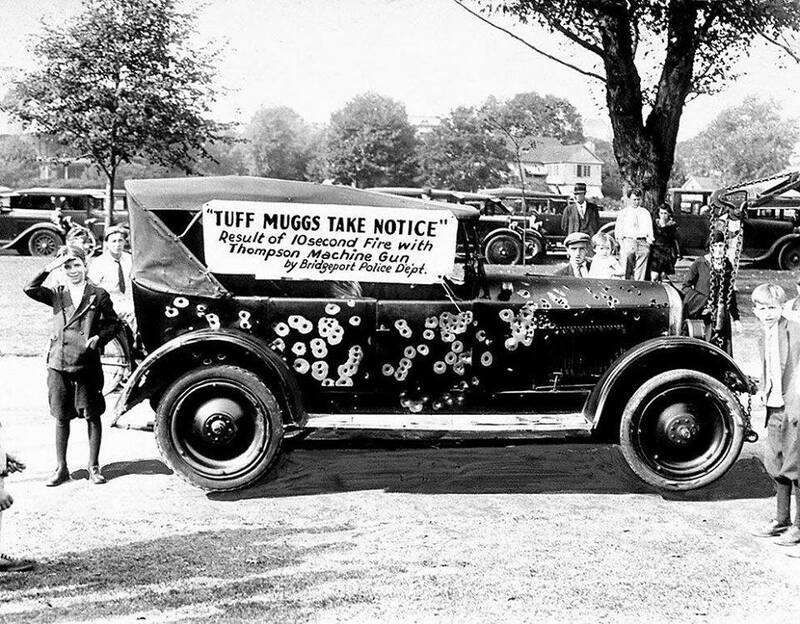 Similarly, towns in Ohio and Pennsylvania have since moved to sell vintage “Chicago Typewriters” left over from the Prohibition-era. Meanwhile, two years ago, police in St. Louis sold 27 of that Missouri city’s stockpile of 30 Tommy guns as part of a $1.2 million deal worked out with a national firearms distributor. Those interested in the Jenkins gun and the stamp collecting that comes with it can contact the city police department as local officials weigh their options. The money raised from the sale of the Thompson will be recycled into the local PD’s coffers.